“Well I think when you create difficult situations for yourself in circumstances in the game, it makes for really difficult decisions as a coach,” Saban said. “Obviously when those things don’t work, you wish you did something else. But I’m very proud of the way our team competed and improved this year. We didn’t play the way we wanted to in the second half of the game that was a personification of lack of attention to detail and discipline to execute. It’s a good answer, I guess, but kind of a non-answer. He can’t exactly call out his field goal kicker for missing kicks and putting his decision making in a box. Well, I couldn’t tell any ill-effects on Auburn yesterday. 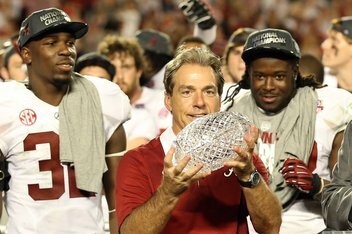 I think maybe coach Saban swung and missed here. That outstanding defensive front helped give up 545 yards rushing to Auburn yesterday.